هدف از مقاله حاضر فهم این مسئله است که آیا تفاوتی بین تلقی استادان زبان عمومی و تخصصی از اطلاعات آموزشی و مهارت‌های تدریس‌شان در سیستم‍‌های آموزشی از راه دور و حضوری وجود دارد؟ 84 نفر از استادان تازه‍‌کار در دوره‍‌های درسی زبان عمومی و زبان تخصصی از یکی از دانشگاه‌های دارای سیستم آموزشی حضوری و 50 نفر دیگر از دانشگاهی با سیستم آموزشی از راه ‍دور برای شرکت در نظرسنجی انتخاب شدند. 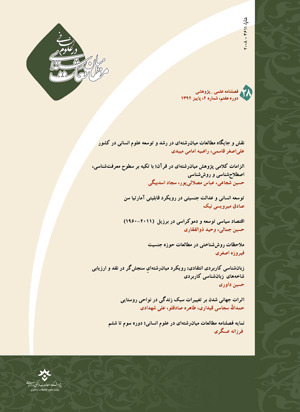 پرسشنامه استفاده‌شده در این مقاله، برگرفته از مطالعه چای و همکارانش (2012) است که 37 سؤال دارد. هر سؤال سطح اطلاعات آموزشی و مهارت‍‌های تدریس استادان را بر اساس خودادراکی‌شان و بر اساس دو مقیاس لیکرت با 5 نمره می‌سنجد. به‌منظور مقایسه میانگین نمرات به‌دست‌آمده از تلقی استادان زبان عمومی و زبان تخصصی از سطح اطلاعات و مهارت‌شان در دو سیستم دانشگاهی، تکنیک آماری MANOVA اجرا شد. نتایج نشان داد که در هر دو سیستم آموزشی، در تلقی استادان زبان عمومی از سطح اطلاعات آموزشی و مهارت‌های تدریس‌شان تفاوت معنا‍داری وجود ندارد. اما، در دروس زبان تخصصی، تلقی استادان از سطح اطلاعات آموزشی خودشان در این دو سیستم بسیار متفاوت است. از نظر سطح مهارت‌های تدریس نیز، استادان زبان تخصصی در هر دو سیستم طرز تلقی متفاوتی دارند؛ به‌این‌ترتیب‌که، استادان زبان تخصصی در دانشگاه از راه دور سطح اطلاعات آموزشی و مهارت‌های تدریس خود را از استادان زبان تخصصی در دانشگاه حضوری بالاتر می‌دانند. Abedeen, F. (2015). Exploration of ESP teacher knowledge and practices at tertiary and applied colleges in Kuwait: Implications for pre-and in-service ESP teacher training (Unpublished doctoral dissertation). University of Exeter, Exeter, Devon, UK. Berliner, D. C. (1988). Implications of studies on expertise in pedagogy for teacher education and evaluation. New directions for teacher assessment (Proceeding of the 1988 ETS Invitational Conference, pp. 39-68). Princeton, NJ: Educational Testing Service. Berliner, D. C. (1995). Teacher expertise. In L.W. Anderson, (Ed. ), International Encyclopedia of Teaching and Teacher Education (p. 46-52), Oxford: Elsevier Science Ltd.
Blum, R. (1984). Effective schooling practices: A research synthesis. Portland, Ore.: Northwest Regional Educational Laboratory. Borich, G. D. (2000). Effective teaching methods (4th ed.). Upper Saddle River, NJ: Merrill / Prentice Hall. Chong, S., Wong, A. F. L., Choy, D., Wong, I. Y-F., & Goh, K. C. (2010). Perception changes in knowledge and skills of graduating student teachers: A Singapore study. The Asia-Pacific Education Researcher, 19, 333-345. Conrad, R., & Donaldson, J. A. (2012). Continuing to engage the online learner: More activities and resources for creative instruction. San Francisco, CA: Jossey-Bass. Dabbagh, N., & Bannan-Ritland, B. (2005). Online learning: Concepts, strategies, and application. Columbus, OH: Merrill/Prentice Hall. Day, Ch., Sammons, P., Stobart, G., Kington, A., & Quing, G. (2007). Teachers matter: Connecting lives, work and effectiveness. Maidenhead: McGraw Hill. Eggen, P., & Kauchak, D. (2001). Educational psychology: Windows on classrooms. New Jersey: Prentice Hall, Inc.
Fessler, R., & Ingram, R. (2003). The teacher career cycle revisited: New realities, new responses. In B. Davies, & J. West-Burnham, (Eds. ), Handbook of Educational Leadership and Management (s. 584-590), Edinburgh: Pearson Education Limited. Fuller, F., & Brown, O. (1975). Becoming a teacher. In K. Ryan, (Ed. ), Teacher Education: Seventy–Fourth Yearbook of The National Society for The Study of Education, Chicago, IL: University of Chicago Press. Glatthorn, A. (1995). Teacher development. In L. W. Anderson, (Ed. ), International Encyclopedia of Teaching and Teacher Education (s. 41-46), Oxford: Elsevier Science Ltd. Herring, M., & Smaldino, S. (2001). Planning for interactive distance education: A handbook (2nd ed.). Bloomington, IN: AECT Publications. Joyce, B., & Shovers, B. (2002). Student achievement through staff development (3rd ed.). Alexandria, VA USA: ASCD. Kagan, D. M. (1992). Professional growth among preservice and beginning teachers. Review of Educational Research, 62(2), 129-169. Katz, L. G. (1972). Developmental stages of preschool teachers. The Elementary School Journal, 23(1), 50-54. Mallikarjun, B. (1989). General and need based second language courses. International Review of Applied Linguistics, 40(5), 230-233. Maynard, T., & Furlong, J. (1995). Learning to teach and models of mentoring. In T. Kelly, & A. S. Mayes, (Eds. ), Issues in Mentoring (p. 10-30), London: Routledge. Morine-Deshimer, G., & Kent, T. (1999). The complex nature and sources of teachers’ pedagogical knowledge. In J. Gess-Newsome, & N. G. Lederman, (Eds. ), Examining Pedagogical Content Knowledge, Dordrecht: Kluwer Academic Publishers. Nias, J. (1989). Primary teachers talking: A study of teaching as work. London: Routledge. Palloff, R., & Pratt, K. (2007). Building learning communities in cyberspace: Effective strategies for the online classroom (2nd ed. ), San Francisco, CA: Jossey-Bass. Píšová, M., Najvar, P., Janík, T., Hanušová, S., Kostková, K., Janíková, V., & Zerzová, J. (2011). Teorie a výzkum expertnosti v učitelské profesi [Theory and research of experts in teacher profession]. Brno: Masarykova Univerzita. Richards, J. (2001). Curriculum development in language education. Cambridge: Cambridge University Press. Salmani-Nodoushan, M. A. (2006). Language teaching: State of the art. The Reading Matrix, 6(2), 125-140. Šimoník, O. (1994). Začínající učitel: Některé pedagogické problémy začínajících učitelů [Beginning teacher: Some pedagogical problems of beginning teachers]. Brno: Masarykova Univerzita. Simonson, M., Smaldino, Sh., & Zvacek, S. (2015). Teaching and learning at a distance: Foundation of distance education (6th ed.). Information Age Publishing. Sorensen, C. K., & Baylen, D. M. (2004). Learning online: Adapting the seven principles of good practice to a web-based instructional environment. Distance Learning, 1(1), 7-17. Sothayapetch, P., Lavonen, J., & Juuti, K. (2013). Primary school teachers’ interviews regarding pedagogical content knowledge (PCK) and general pedagogical knowledge (GPK). European Journal of Science and Mathematics Education, l(2), 84-105. Steffy, B. E., Wolfe, M. P., Pasch, S. H., & Enz, B. J. (Eds.). (2000). Life cycle of the career teacher. Thousand Oaks: Corwin Press. Tikunoff, W. J. (1983). Utility of the SBIF features for the instruction of limited English proficiency students. San Francisco: Far West Laboratory for Educational Researchand Development. Wilkins, D. (1974). Second-language learning and teaching. London: Edward Arnold. Wilson, S. M., Floden, R. E., & Ferrini-Mundy, J. (2001). Teacher preparation research: Current knowledge, gaps, and recommendations. A Research Report Prepared for The U.S. Department of Education by The Center for the Study of Teaching and Policy in Collaboration With Michigan State University.